This is my poem for #OctPoWriMo day 2. The prompt is the word (or the number) 2 (to, too). It is not my strongest effort, but I'm still proud of it. Please enjoy. is like manna from Heaven. and got stuck at two. Awww...what a sweet poem. 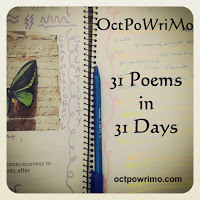 Thanks for linking up at OctPoWriMo! Thank you, Tamara. I really appreciate your visit to my site!